The winner of the free DHI Hair Transplant! And the winner is … Konstantinos Tsagkanis! 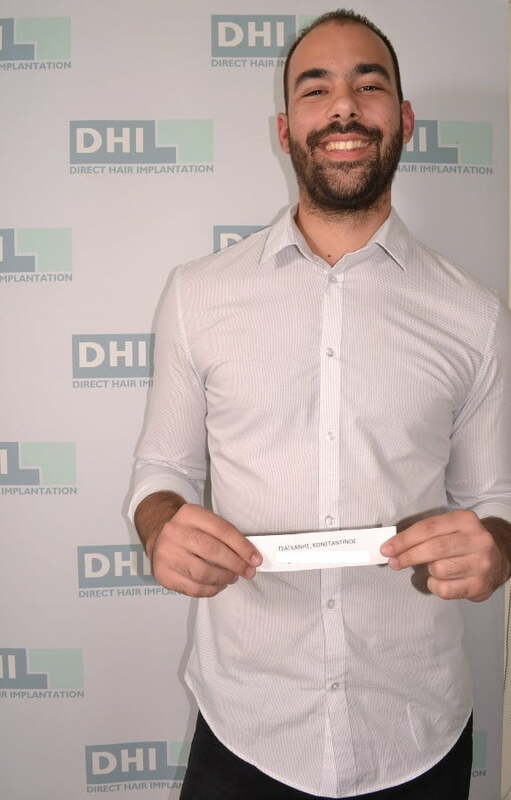 So this is the lucky candidate who won the free DHI hair transplant up to 10.000 hairs! Within the next few days, Kostas will have the unique opportunity to make his dream come true! Kostas is 27 years old; he is an office employee and lives in Athens, Greece. DHI’s unique DSA diagnostic system for hair loss sawed that his hair loss problem is on the zones A, B and C.
After being informed by telephone for the result of the draw, the winner of the competition visited the DHI clinic in Athens and with a big smile on his face he stated that he is looking forward on having the hair transplant. “I am so excited and I feel very lucky! Due to my hair loss, I always wanted to get a hair transplant. So, when I read about the DHI Global Medical Group offer, I send an email immediately! I was so lucky and now I look forward for the day of my hair transplant. I want to thank DHI Global Medical Group for the great offer” said Kostas during the meeting with the director of DHI Athens, Mr. George Stathis. The free DHI hair transplant will be documented by DHI Global Medical Group. The draw for the free Giga Session took place on May 28 at the fully packed auditorium of the University of Athens, during the Academy Masters Meeting 2016. The number of the participants exceeded 150! DHI Global Medical Group wishes to thank all those who have registered in the competition!